From an April 2007 general conference address. Some years ago, I met a remarkable family. Each member of the family had an unshakable testimony of the reality of the Resurrection. Each of the children had been born with a rare form of muscular dystrophy. The only daughter, Shanna, was then five years old. All of the children were intelligent and faith-filled. And it shines in the sky for me. Death is an essential part of our mortal experience. And dead we would remain except for Jesus. He died on the cross. His body was placed by loving hands in a sepulchre. On the first day of the week, Mary Magdalene and Mary the mother of James, along with others, came to the sepulchre. To their astonishment, the body of their Lord was gone. Two men in shining garments stood by them and said: “Why seek ye the living among the dead? He is not here, but is risen” (Luke 24:5–6). “The Beautiful Day,” from the movie Scrooge (1970), music and lyrics by Leslie Bricusse. “I Know That My Redeemer Lives,” Hymns, no. 136.
sepulchre, testimony, astonishment; He is risen! Fill in each blank with an opposite word, shown in bold in President Monson’s message. 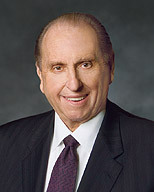 Fill in the blanks with words from President Monson’s message. Then use the numbered letters in correct order to spell out the amazing news of Easter. See the answers on page 48. Another word for the tomb where the body of Jesus was laid. A knowledge of something that is true. The feeling of great surprise that Mary and Mary had when they saw the empty tomb.